The “Summer of Love,” 1967, served as the epicenter of the counter-culture, beckoning thousands of young people to the San Francisco Bay Area. That same year, John Meyer was tapped by Steve Miller to develop a better sound system for the blues rocker's Monterey Pop performance. While it would be another decade before Meyer Sound was formally founded, this formative period laid the cornerstones for the company. 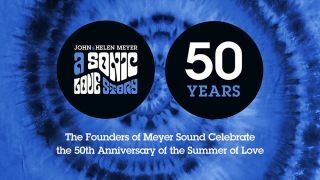 Throughout 2017, to celebrate the 50th anniversary of the Summer of Love, John and Helen Meyer will visit key Meyer Sound customers, host exclusive curated events in Meyer Sound environments at the company's Berkeley, CA campus, in the San Francisco Bay Area, around the U.S., and around the world. John and Helen will highlight their handcrafted audio products, systems, and ideas for live music of all genres in concert halls and stadiums, corporate settings, educational arenas, theaters, houses of worship, restaurants, cinema post-production and exhibition, fine art projects, and more. As part of the celebration this year, the gates to the Meyer Sound factory and laboratories will open to a few guests through a contest for an all-expense paid trip to visit the campus in Berkeley. As a central hub for information about Meyer Sound innovation, products, ideas, and the Summer of Love 50th anniversary celebration details, the redeveloped and expanded Meyer Sound website has also launched, at meyersound.com. "1967 was a remarkable time in music and live sound with the freedom to work alongside a new generation of artists," said John Meyer. "The opportunity to innovate was everywhere. The Bay Area was in the center of it all with creative artists, a free spirit, and high-level universities providing R&D resources. This was the inspiration for Meyer Sound, and we've remained dedicated to this spirit of handmade innovation ever since." "To celebrate, we're creating an incredible program for 2017," said Helen Meyer. "We will travel near and far to see our customers and creations and participate in exclusive experiences, to launch important new products, host game-changing listening experiences, increase our festival presence and collaboration with key touring partners, and explore new Meyer Sound frontiers, such as China and India. We have some special surprises in store and can't wait to reveal them at just the right moments!"